Magic Excel Recovery undeletes or recovers spreadsheets created in any version of Microsoft Excel or OpenOffice including Excel 2013. Its highly sophisticated data recovery algorithms come straight from Magic’s top of the line partition recovery tool, enabling surefooted recovery from highly problematic, unreadable and inaccessible storage devices, repartitioned hard drives and formatted partitions. 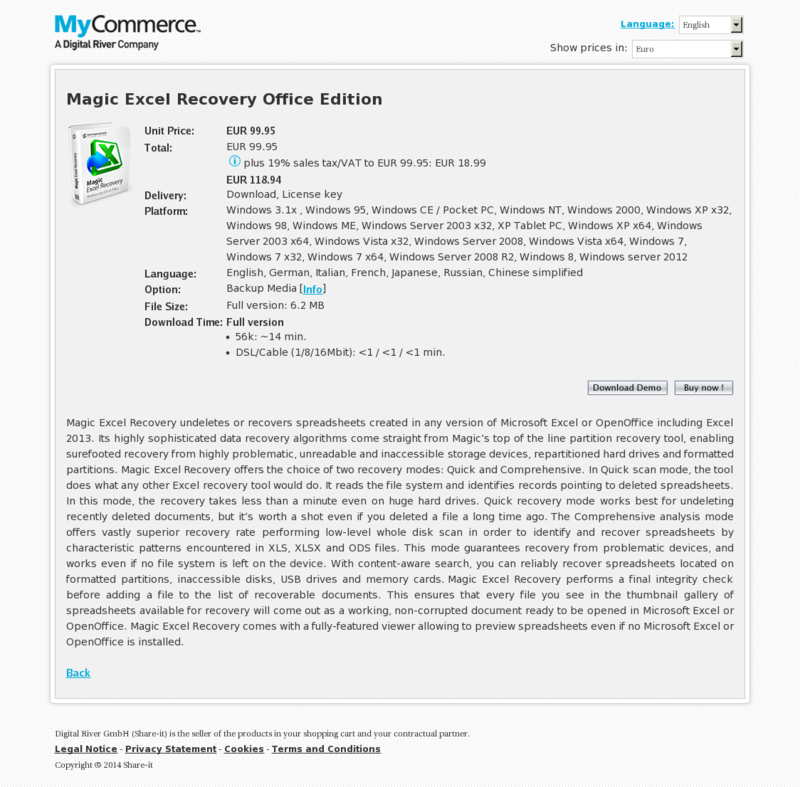 Magic Excel Recovery offers the choice of two recovery modes: Quick and Comprehensive. In Quick scan mode, the tool does what any other Excel recovery tool would do. It reads the file system and identifies records pointing to deleted spreadsheets. In this mode, the recovery takes less than a minute even on huge hard drives. Quick recovery mode works best for undeleting recently deleted documents, but it’s worth a shot even if you deleted a file a long time ago. The Comprehensive analysis mode offers vastly superior recovery rate performing low-level whole disk scan in order to identify and recover spreadsheets by characteristic patterns encountered in XLS, XLSX and ODS files. This mode guarantees recovery from problematic devices, and works even if no file system is left on the device. With content-aware search, you can reliably recover spreadsheets located on formatted partitions, inaccessible disks, USB drives and memory cards. Magic Excel Recovery performs a final integrity check before adding a file to the list of recoverable documents. This ensures that every file you see in the thumbnail gallery of spreadsheets available for recovery will come out as a working, non-corrupted document ready to be opened in Microsoft Excel or OpenOffice. Magic Excel Recovery comes with a fully-featured viewer allowing to preview spreadsheets even if no Microsoft Excel or OpenOffice is installed.